While being the standard approach to a 4-4 point stone, the 6-3 point is rarely played as the first move in the corner. It secures a foothold on one side and invites the opponent to jump into the corner, often leading to double approach or tenuki joseki lines that are not bad at all for Black. It was played in 1925 by Shinohara Masami (and 1929-10-23 by Hashimoto Utaro). Now it is used by the Korean player Yang Keon. for developments after White at a. 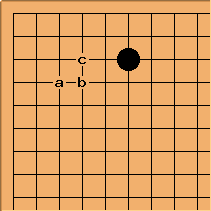 Variations after White at b are at double kakari.